In the New Testament Mary is only mentioned a very few times after his birth and childhood and Tóibín expands on those – the raising of Lazarus from the dead, the wedding at Cana and the crucifixion. 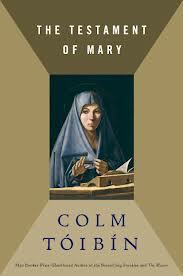 In Tóibín’s book Mary is not a total convert, but much of that is left to the reader’s interpretation. I wasn’t as enthralled by the book as some reviewers, but it was an original concept, nicely written with an interesting structure.